Latitude 47.571647 Longitude 2.949593. 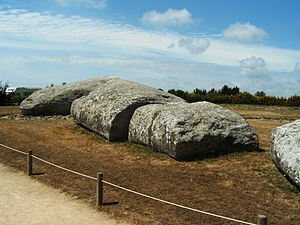 The site of the massive monolith or menhir is at the northern side of the village of Locmariquer, Morbihan region, and just west of the cemetery on the D781 (Route d’Auray). The nearest town, Auray, is 10 miles to the north. It’s name means ‘great broken standing stone’ because that it what it is today. But a more romantic name for the broken standing stone is ‘the fairy stone’ (Menhir Hroeg or Er Grah) because it was thought to have been erected by the little people, or the fairy folk lived there and, maybe still do. But in actual fact it was set up by Neolithic tribesmen in 4,500 BC – the huge stone being brought here from an outcrop of rocks near the estuary of the river Auray, some 7 miles to the north of Locmariquer. Today, sadly the grand menhir lies on the ground having been broken into four sections by a lightning strike, or some think by an earthquake, but originally there were five sections – probably a small fragment has been lost. It is now thought that the menhir was broken by human involvement in two distinct stages. When it stood upright, if it ever did, then it would have been over 20 metres or between 64-66 feet high and it’s weight calculated to be around 300 tonnes or more, perhaps making it the largest monolith in Europe – or one of the largest in western Europe? However, the menhir would have been placed several feet into a round-shaped pit which has now been partially filled in. The girth of the stone at it’s base being approx 4 metres. The four remaining lumps of stone are carved and shaped smoothly around their narrower edges and also on the broad faces, and there is a carving of what is perhaps an axe in it’s wooden haft on one of the stones. Near the top of the menhir the stone narrowes to form a roughly pointed shape, something that might cause it to be seen as phallic in appearence, but more than likely the stone was, or would have been used, for astronomical purposes. There were probably other standing stones here because a number of socket holes have been excavated running in a straight northerly direction for 180 feet, but of these only small stones remain. The grand menhir and it’s accompanying stone row were no doubt aligned with the winter and summer solstices and, quite probably a lunar happening such as an eclipse at the time of construction. Behind the grand menhir is another prehistoric site that is linked. This is La Table des Marchand also known as The Merchants’ Table, a Neolithic passage-grave that has now been reconstructed. Actually, it is a dolmen that stands within the remains of a burial mound (tumulus) that measures over 36 metres or nearly 120 feet across. As the name suggests the monument is very like a stone table albeit three tables or capstones that are supported by 17 curved and slightly pointed upright stones. 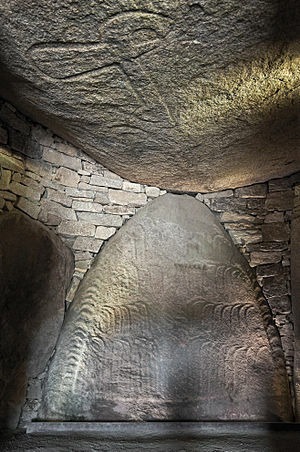 Below the largest stone table there is a gallery with stone-built walls around the chamber; the large stone table resting at one end on one of these curved supports, this one in particular has carvings of sun-ripened wheat ears. And the underside of the large table or capstone has an interesting carving depicting what is thought to be a plough in the form of an axe that connects up by a shaft that has slight traces of a harness and oxen (long-horned cattle), the back legs of one of these animals can be just made out, although it is rather faint now. There are two more dolmens in the village. At the northern side stands The Dolmen of Mane Lud and in the centre The Dolmen of Mane Rethual – both of which are worth looking at if time is not too tight. Michelin, Brittany Tourist Guide, Michelin Tyre Limited, London, 1983. Scarre, Chris (edited)., The Seventy Wonders Of The Ancient World – The Great Monuments And How They Were Built, Thames & Hudson, London, 1999. © Ray Spencer, The Journal of Antiquities, 2012. Categories: La Grande Menhir Brise at Locmariquer in Brittany, Standing Stones | Tags: La Grande Menhir Brise at Locmariquer in Brittant | Permalink.